Copyright: Entrants give full permission granted to Mediflow to use the photographs, with proper credit to the photographer. Enter photos that emphasize the versatility of water. 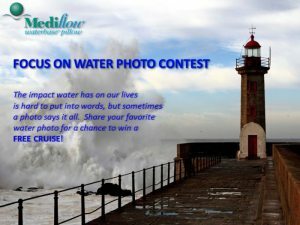 Whether it is a photo depicting the benefits of water (such as water used for farming, transportation, energy, or just plain fun) or a photo telling the tale of exactly how fierce water can be can, we want to see water from your perspective. GRAND PRIZE is $1500 worth of Carnival® Cruise Line gift cards, redeemable towards a cruise to the destination of your choice! Winners will be posted April 2, 2013. Public voting on Facebook from March 16th.